Zaltaxar B&B i Puerto Natales, Chile: Reservér nu! 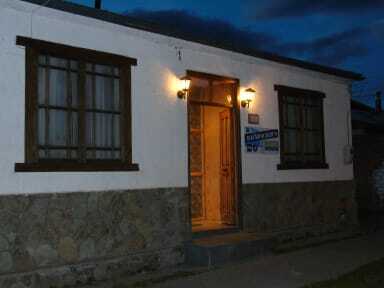 Zaltaxar is a very warm Backpacker’s hostel in the middle of the Patagonia, perfect for long-way travelers. It has spacious places to share, a large and well prepared kitchen, showers with great temperature and pressure, comfortable bedrooms and a big backyard for bicycles, motorbikes or to review your camping equipment. Zaltaxar is only four blocks from the bus station and three blocks from the principal street (Manuel Bulnes). In this sense, from our facilities you can reach some of the finest attractions and landmarks of the area such as Square May 1 and Square 21 May, Muelle Viejo and Museo Histórico Municipal, amongst other other interesting spots of our city. Each bedroom has, four beds (two bunk beds per bedroom) with an individual light and outlet, lockers for every passenger. The bathrooms are separated by gender (male and female). The living room is spacious, with armchairs, TV, center table and dinning room. The kitchen is large, with all the equipment needed to have six persons cooking simultaneously.